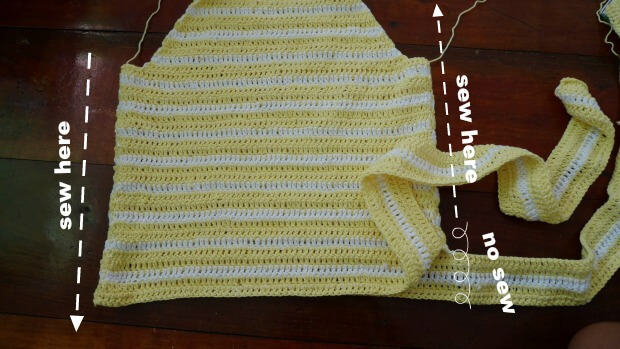 Easy crochet summer top for the sunny day! Summer season is here! The weather is so hot right now I been outside with 40 degree calciols! Oh Mind Donut! I am melting lol. Sometime I feel like a dry fish ^^. 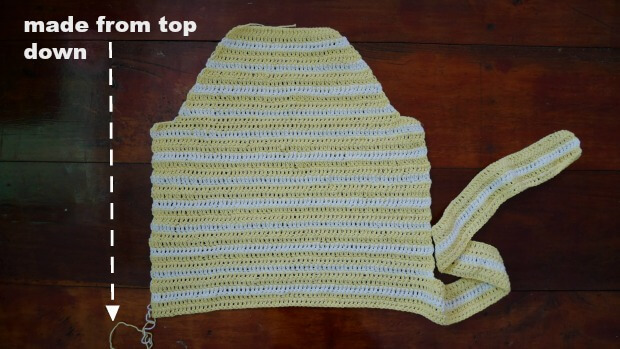 So I had pick up some yellow color cotton yarn for the easy peasy crochet summer top, they are beginner friendly mostly made from double crochet, if you guy can do double crochet this pattern for crochet summer top is perfect for you! This top is made from 2 pieces of….. I don’t know what to call the shape maybe rectangle? front panel and back panel is the same pattern for the cute bow is part of the top too! If you guy cannot get enough of the summer top here I have more for u. – I used Lion brand 24/7 cotton yarn weight 4 aran. I use around 700-800 yard. 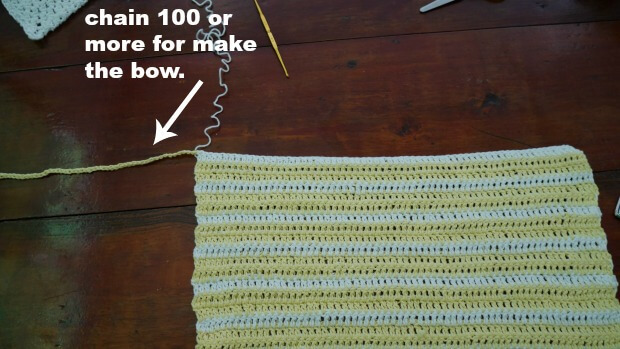 This pattern is made for beginners! There is a basic skill level required to make. 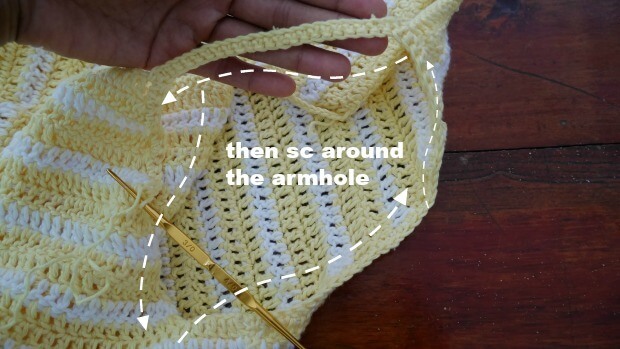 If you don’t understand any technical crochet words, don’t worry I got you cover! 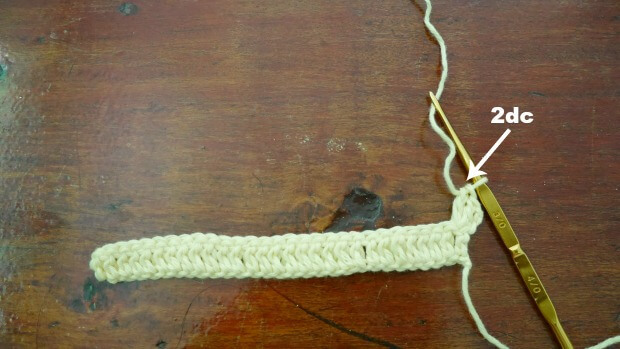 Here is a video titled ‘free crochet class on craftsy‘ and a free pdf file titled ‘the beginner’s guide to crochet‘. These will explain a lot for you. This top is made in size small. the other sizes are easy to adjust by just add more chain to make it wider . see pattern detail below for bigger size. For me the model wearing this piece, I am 4’9 feet tall. This top is made from top down. We will make this summer top from top to bottom. yellow, Row1: make 1dc in the next chain from hook and across until the end of the row, ch2 turn. yellow, Row2. 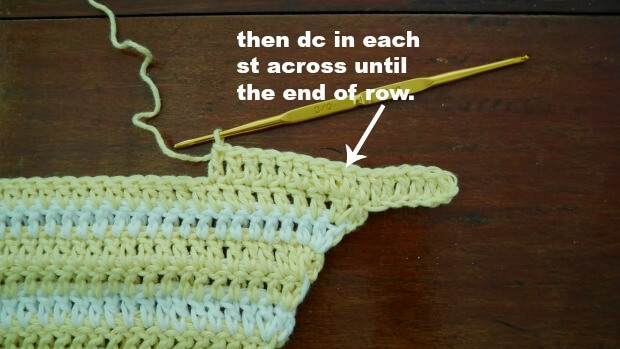 now you will work 2dc in first stitch then 1dc in each stitch across until end of the row on the last st make 2dc. ch2 turn. white, Row3. 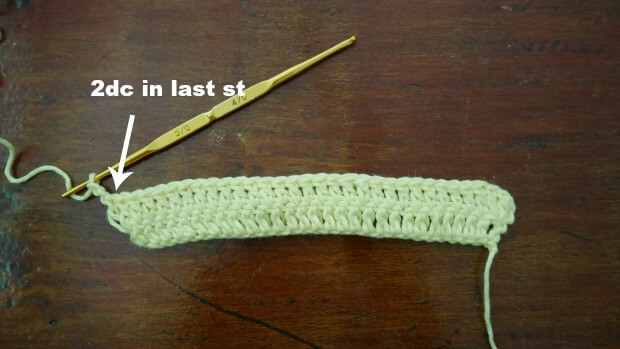 now you will work 2dc in first stitch then 1dc in each stitch across until end of the row on the last st make 2dc. ch2 turn. Row 4-12. repeat row3. 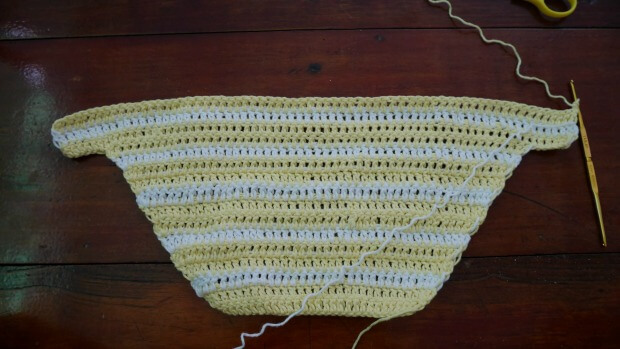 and we will switch up the color by use yellow color for 2 row and white color for 1 row. On this row13. we will start to make a body of the top. Row13. 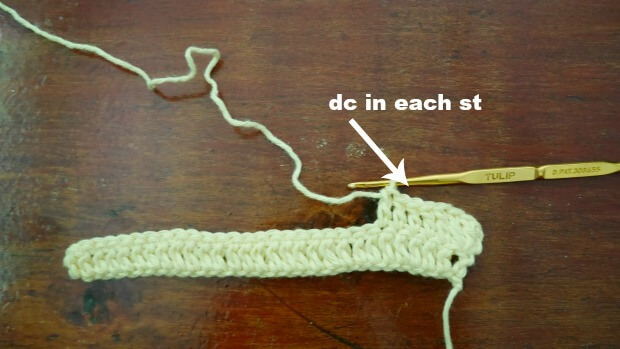 now you will work 2dc in first stitch then 1dc in each stitch across until end of the row on the last st make 2dc. then ch6 ( size small) turn. then ch6 ( size small) turn. add chain on each side or you can add more chain to increase your size that will fit you bust. ch12 ( size medium) turn. ch18 ( size large) turn. ch 24 ( size XL) turn. ch30 ( size 2XL) turn. ch34 ( size 3XL) turn. 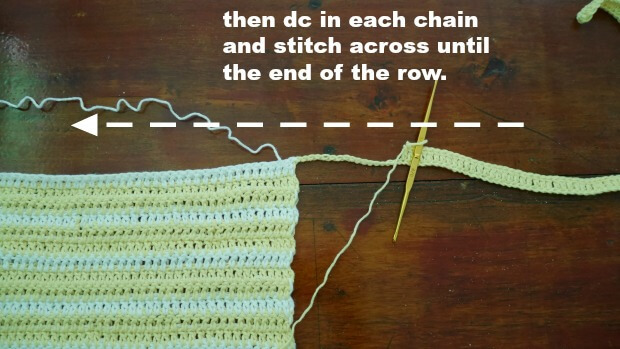 Row14: make 1dc in the next chain from hook and in each st across until the end of the row, ch2 turn. Row15: make 1dc in the next chain from hook and across until the end of the row, ch2 turn. 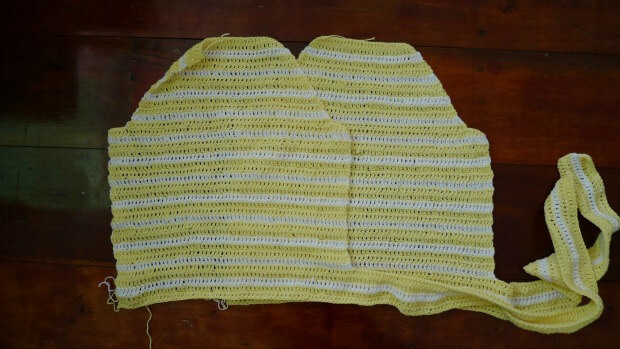 Row 16 and beyond ,….Repeat row 15 and switch up color until you get 13 inch long. or your desired length and we will start to making the bow. 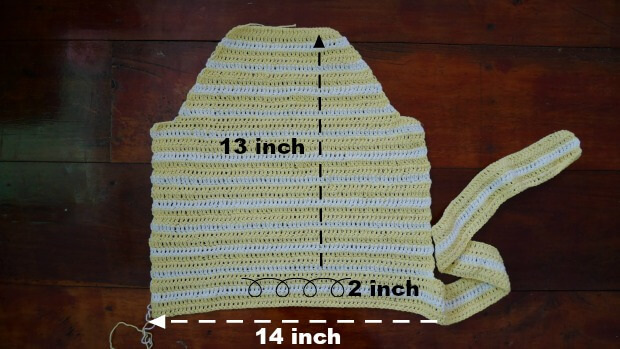 When we get to 13 inch long for the body length now we will start to chain about 100 chain , if you guy love your bow longer then you will add more chain for example 120, 140…. etc.. as you can see in the photo above. Then row1. we will make dc in each chain and stitch across until the end of the row, ch2 turn. We will repeat row1 until you get about 2 inch thick for the bow, if you want the bow bigger you and repeat row1 until you get your thickness of bow like 3 or 4 inch thick. The bigger bow the better. After we finished first piece then we repeat the same process for the second piece. After we got 2 pieces , now it’s time to assembly. Lay 2 pieces in flatted on top of each other. Then sew on the side, for the bow area no sew for have space to tie up. see photo below. Make strap for the top. 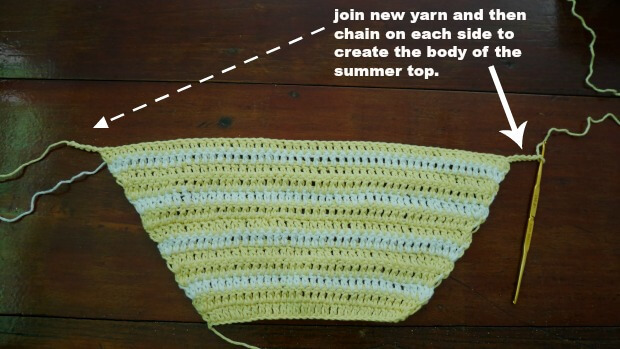 join new yarn then chain 25 and connect the end of chain to the back piece. Now time to making the armhole look pretty. After we create the armhole, now it’s time to make it pretty. by sc around the arm hole for 1 round including the strap. 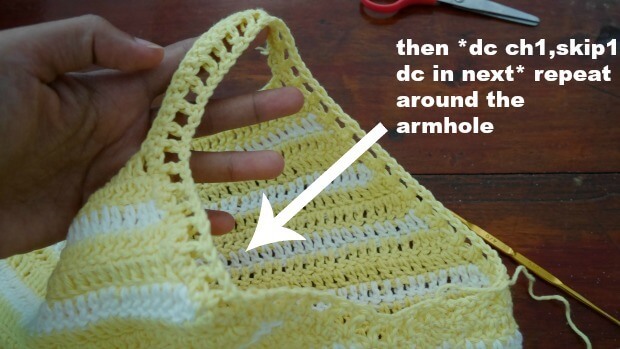 then ch2, *dc,ch1, skip1 st then dc in next stitch* repeat * to * around the armhole. Fasten off. And repeat the same for the other side of the armhole. If you make one I would love to see your creation tag me on Instagram! 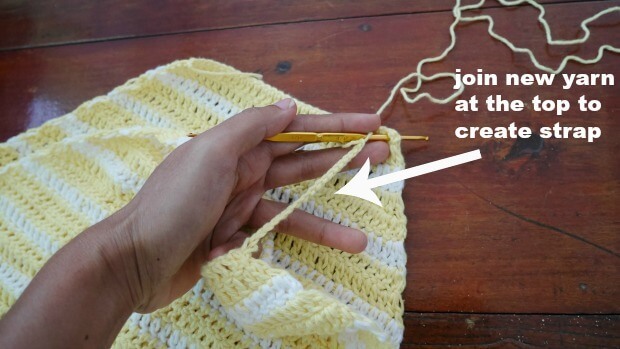 Can’t crochet or don’t have time? no worry! Get unique custom handmade just for you on Etsy and a plus you guys all support small business owner! How difficult would it be to leaf off the bow area not my style. Hi Tonda, If you leave the bow, it will be very easy just leave out at the bow instruction by that I mean no chains at the bottom of the top.